Machining and drilling of another of the horizontal frame stretchers is now complete and it is ready to be fitted into the frames. 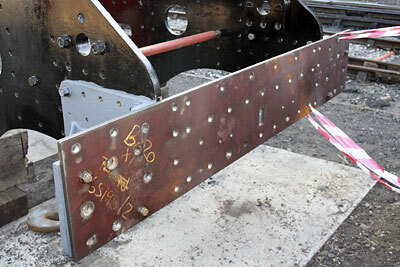 The next horizontal stretcher is set up on the table of the boring machine ready for work to start. 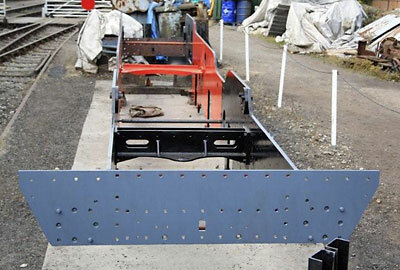 Some painting work has continued on buffer beams and corner brackets for weather protection, however these will have to be removed shortly for work on these items to continue. 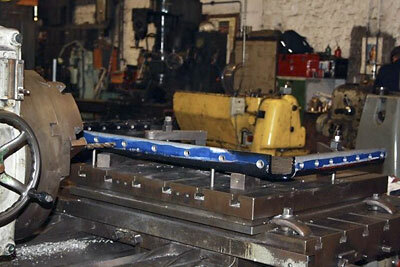 An order has been placed with Dave Hewson of Sheffield for the fabrication of two vertical stretchers. A couple of interest photos of Class 3 tanks in BR service from photographers Bill Wright and Tony Gillett showing 82019 at Waterloo, 82023 Waterloo and 82036 at Gloucester, Horton Road. The sales and tombola stands were very popular at the Gala and thanks are due to everyone who gave gifts for us to sell, and for the tombola. 82045 member John Gupwell did a tremendous job manning the tombola and managed to 'sell out' by mid afternoon on the Sunday. Almost £600 was raised on the tombola alone. Many thanks, John! We have a limited number of prints available to our supporters. This is a very nice pencil sketch of 82045 drawn in 1998 by retired engineman Ray Ruffell (now deceased) and comes ready to frame. The image (overall) measures approx 17"x 121/2" and costs £10.00 including P&P. And finally a reminder that we have warm hats and scarves available - visit our sales page where you can purchase warm hats, scarves, cuddly fleeces and coats before the winter really sets in! 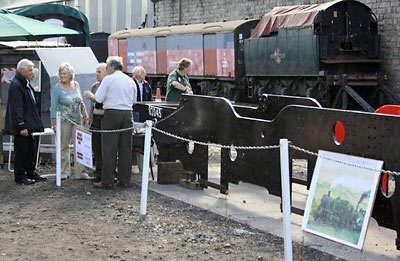 There was much interest in 82045 over the Gala weekend, particularly in the construction of the loco. Chris explained how 82045 will be built using traditional engineering techniques. 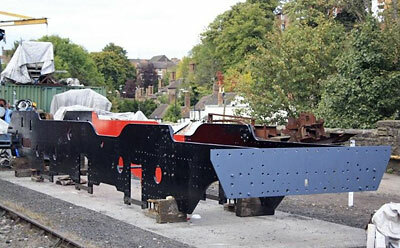 As far as possible, the new loco will be on public view during its construction, thus providing opportunities for people of all ages to learn about the engineering skills for which our country was once renowned. 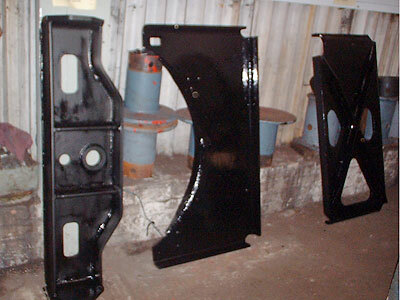 Two views of the frames with the rear buffer beam in place. 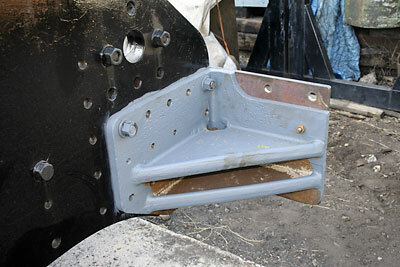 Two photos of another of the horizontal frame stretchers on the horizontal boring machine. 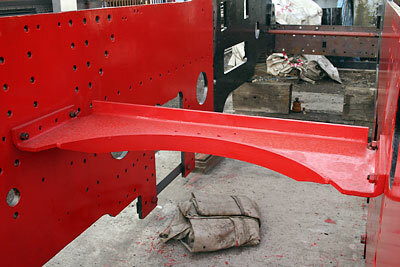 Painting continues off of the loco too. 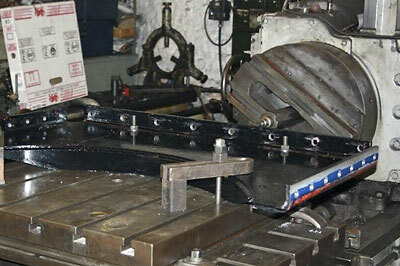 The middle of these three stretchers, with the semi circular cut out, is on the boring machine in the photo above. Photo by Gordon Barnes, 11th October 2009. 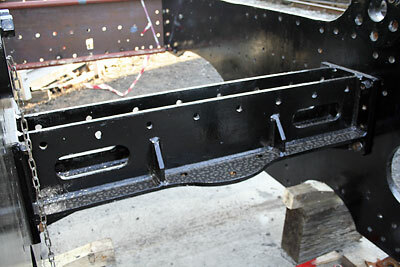 Four close up views of the recently fitted stretchers, front buffer beam and buffer beam gusset brackets. And if you're lucky enough to have an iphone or itouch, save this web site to the Home Screen and enjoy a dinky little logo!